Romano Artioli visits Bugatti in Molsheim for the first time. The French hyper sports car manufacturer Bugatti received a very special guest this week: Romano Artioli, the famed automotive entrepreneur who has not lost his passion for hyper sports cars. He came to Molsheim for the very first time in his life to witness the strength of the brand that he had once revived in the late 1980s. 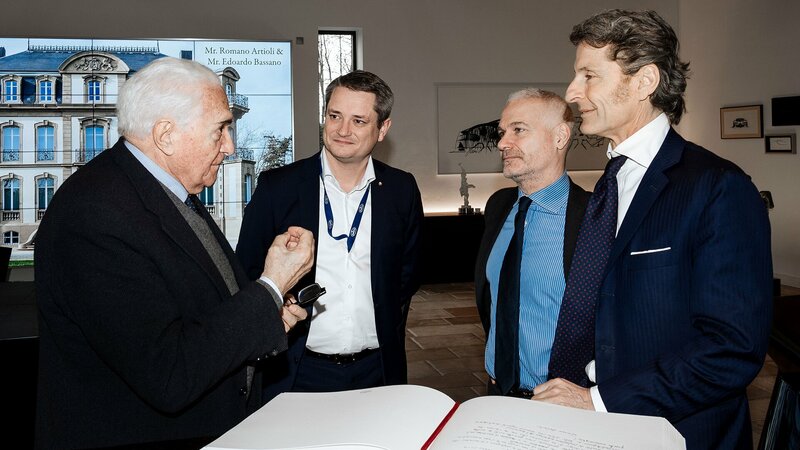 At the age of 86, but with the enthusiasm of a young boy, Artioli analyzed the current developments of the automotive world in general and of Bugatti in patricular in talks with Bugatti President Stephan Winkelmann. In the 1980s, Romano Artioli was a very successful car importer and dealer in Northern Italy, especially for Ferrari and several Japanese brands. His car collection, however, showed a great predilection for Bugatti, a brand featured with many historic models in his garage. So much so that he decided to try and revive the legendary French car brand. Artioli bought the Bugatti trademark in 1987 and became chairman of Bugatti Automobili S.p.A. He build an outstanding production site in Campogalliano where he produced the Bugatti EB110 between 1991 and 1995, before having to close the doors of his factory. Today, everything is back to how it started. Bugatti came back home to Molsheim in 1998 where it is since working on manufacturing the most outstanding hyper sports cars in the world. Romano Artioli, for his part, is the big Bugatti enthusiast he has always been. At the age of 86, he is far from feeling like retiring from his professional endeavors. “The automotive world is far too exciting. When you come to a unique place like Molsheim and breathe in the pioneering spirit that lies in the air here – how could I retire and miss out on all the exciting, revolutionary developments to come?”, explained Romano Artioli.